Multi-colored LED bulbs, 50 counts, Bright enough, Up to 90% energy saving. Great decoration for home, Christmas trees, bushes, patio, eaves, garden, lawn, backyard, gate, and porch by hanging the string lights securely with the convenient hooks. It can create a cheerful atmosphere for a party, wedding, and holidays, festival celebration. 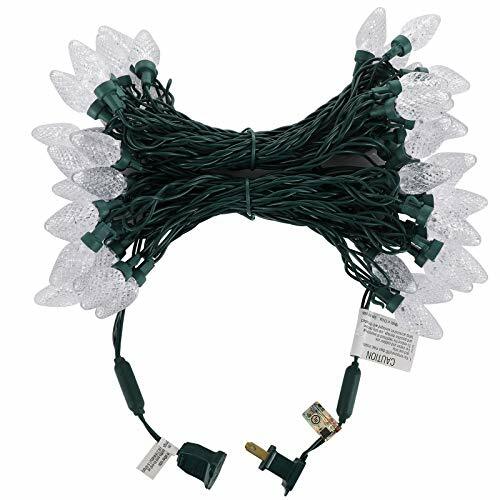 This LED fairy string lights have an overload protection (replaceable fuse plug). You can connect up to 45 strings of the same set by end-to-end or attach other decorative lights up to 216 watts in total. UL listed, IP44 waterproof ,Safe for indoor and outdoor use; Selected PVC material for insulation, flexibility, and heat/cold resistance; easy to use and retract. 【Super Bright & Energy Saving】: 50 count C7 LEDs, brighter than traditional incandescent string lights, flicker-free lighting; 4.8w rated watts, low consumption, Up to 90% energy saving; Excellent heat dissipation and Bulbs are Cool to the Touch when Lit, long lifespan up to 50,000 hours. 【Considerate Design with Green Wires】: 33.3 ft lighted length, 8" bulb spacing, 4" lead length (on both ends) ; blends easily into the wall, window, curtain and deck; no worry about hiding excess wires. 【Connect Up to 45 Sets】: Plug and play, connect up to 45 strands or attach other decorative lights up to 216 Watts in total; allow you to decorate your home with the desired length. 【Safety Guaranty】: UL listed, IP44 waterproof level, safe for Indoor and outdoor use, this LED string lights adopt overload protection (fuse), 2 replacement fuses included.